With springtime just around the corner, we’ve been looking at our wardrobes and wondering if we’re ready to dress for the warmer weather. We thought you might be feeling the same, so we’ve put together three outfits which will ensure you’re ready for the sunshine. Better yet, we’ve only used items which are in the People Tree Sale, so grab yourself a great new look for a bargain price now! Outfit One – Look pretty in pink by pairing our Ava Blouse in Coral Stripe with our Sherry Cropped Trousers in Pink. Both of these pieces are made using cotton which is hand-woven by highly skilled weavers from Artisan Hut in Bangladesh, so not only are they bright, but also light enough for the warmer spring/summer months. Add our hand-made Half Moon Earrings, which will elegantly frame your face, and you’re good to go, whatever the occasion! 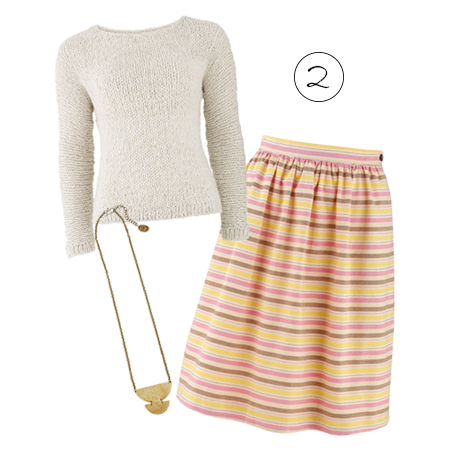 Outfit Two – Stripes are always a great choice for spring, and the cheerful colours used in our Brooke Stripe Gather Skirt are sure to brighten your day. Put together with our hand-knitted Esme Wool Cream Jumper, you’ll not only stay warm when it’s breezy, but also look stylish and on trend. Our Twin Moon Necklace adds an extra touch of glamour to this already, super chic ensemble. Outfit Three – Our Karen Horse Print Flared Dress has a great print, fit and colour scheme – what more could you want? Throw our Alison Loose Knit Cardigan on top to ensure goose bumps are kept at bay on a chilly day. And for an additional bit of glitz, add our Leaf Drop Earrings, which are subtle enough for day, but sparkly enough for night! Posted in Fashion, People Tree•Tagged Amelia McColl, ethical fashion, fair trade, Fair Trade fashion, fairtrade, fashion, organic, People Tree, sale, sustainability, sustainable, sustainable fashion•by People Tree•Leave a Comment on The Sale Does Springtime!